After our adventures in Bordeaux buying, the man and I decided to buy a wine fridge after all. Hooray! We ordered online from the Home Despot (yes, despot), and hoped our fridge would arrive in fairly short order. Worst decision ever. After a couple days, I received an email that my order had shipped. I tried to track it online, but no dice. I called the Home Depot to ask why it wasn’t working, when I was informed that it was being shipped by a “Common Carrier” and couldn’t be tracked online. Could I have the name or contact information of the carrier? Of course not. Despite multiple requests. The only thing I was ever told was that the carrier (who would insist on remaining nameless) would contact me 24-48 hours before delivery to arrange a time to receive the order. Fine then. I received a very cordial call from the freight company and set up a delivery time. Not a convenient one, but a time nonetheless. Between 11am and 1pm on Friday. So I went into work early, and packed myself up to get home by 11am to work from home and wait. That’s when I got a faint knock on the door. The delivery driver was there, saying my buzzer didn’t work. Too bad he tried the wrong buzzer entirely, even though the correct number was written on the delivery slip. No matter, the fridge is here! Fridge is unloaded, delivery guy leaves, I rip open the packaging like a kid on Christmas! 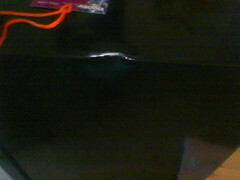 A huge unsightly gash in the side of my pristine fridge! So I call the Home Depot, which is where they had a chance to make things right, and instead did absolutely everything wrong. I’m instructed to keep the original packaging (have you seen how much stuff comes packaged with a fridge? I’m going to have to sleep with the stuff!) and the carrier will be instructed to contact me to set up a time to pick up the busted up appliance. There goes another few hours off work. But instead of sending another fridge to a valuable customer in good faith to exchange the units, the Home Despot insists on waiting for the broken unit to arrive back in their Burlington ON warehouse (a mere 4500 kms away) before sending the replacememt back across the country to me. No, there is apparently no way around this. I can’t work with a local store to make a swap, and there’s no way they’ll send a whole extra unit (I mean, I’m sure having that extra $250 out of the warehouse makes a HUGE dent in their bottom line, right?) as a replacement at the same time as the pickup. I replied that I would arrange a time for them to pick up the fridge and would like them to promptly cancel my order. It took two weeks to get the original fridge, I’ll be damned if I’m going to take yet ANOTHER day off on top of the return pick-up and wait about four weeks to receive an appliance I can get at innumerable other places. I also asked for a supervisor or customer service person of some sort to contact me to discuss the issue, since I find it all pretty ridiculous, and I’m hoping that someone other than their friendly but ultimately useless call centre monkeys can actually find a reasonable solution to the issue. Considering the speed and concern with which my issues about the neverending bathroom reno were addressed (read: none) I don’t have high hopes. Until then, no more Home Despot for me. I’ll pay more and shop around elsewhere if it means avoiding supporting such terrible practices. In the meantime, I think I’ll crack open one of the bottles of currently un-refrigerated wine, and weep. If it makes you feel any better, the bordeaux Brook and I bought for our 10 year anniversary is wrapped up in an old comforter and stuffed in the bottom of a closet. Very classy. Question: Why didn’t you just go buy one at a local Home Depot? Anyhow, I would just take it to one and get them to exchange it – to hell with customer (non)service. I figured the delivery would be easier (with my tiny fridge). I might try harassing a local store to see if I get a better response. Man, that sounds *just* like my fridge horror story with Sears, only mine includes twice waiting, and twice f-ups by Sears, with a combined total of 6 hours invested. And, I won’t be compensated, because I rent, and I didn’t order it. I despise Sears Home Delivery. Good luck with your replacement search! Costco.ca has some great deals on wine coolers. You should post this badboy to http://sutori.com. Obviously the company is run by complete idiots! Go to a close homeDepot, buy a new fridge. Go home, pack the dinged one in the new ones wrappings. Go back and return it. They’re at 1008 Homer and for less than $3 per case per month they’ll catalogue your wine and store it in ideal conditions. Thanks anon, whoever you are. If I were to start really investing in wine, I’d definitely consider storing it at a facility like Wine Vault. However, I’m not too proud to admit that the biggest appeal of the wine fridge is my superficial yuppie desire to have one so I can display my amateur but enthusiastic collection, guiltlessly crank the heat in my small apartment and still have room in the fridge for beer. Year after year the Home Depot sends out a press release on how they are going to spend millions of dollars on customer service. 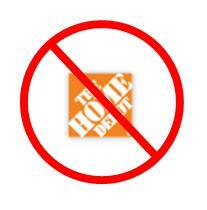 I have a news flash for the Home Depot “It is not working” When I signed my contract on 9-14-05 the Home Depot was full of promises and now they can not seem to keep them. Now almost 14 months later and problems still are not corrected you can see the Home Depot just does not care about its customers. They will lose one customer at a time and end up like the old HQ. You can visit my web site at http://www.freewebs.com/myroof to see the distruction. Previous Previous post: Is this thing on?